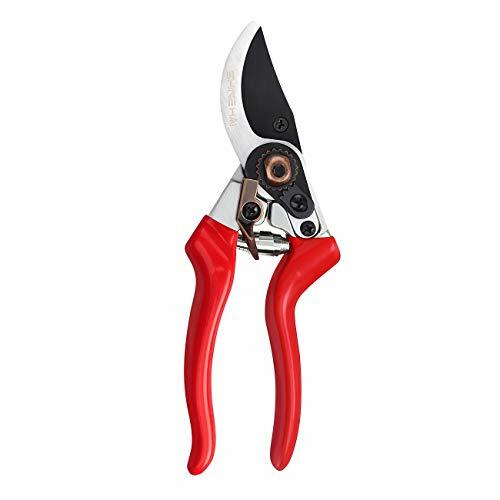 Maximum Cutting Capacity: 8.5" professional pruning shears, supporting cutting up to 1/2" diameter size tree branches, which may vary on tree species, ideal for cutting stems and light branches. Durable Material: All SK-5 high carbon steel design provides excellent durability for long-lasting value. Reliable fully hardened precision-ground SK-5 Japanese steel sharp blades enable heavy use for a variety of general pruning tasks. ILAFLON Coating: Low-friction ILAFLON Resist R Plus coating and sap groove design guarantee anti-rust and make cutting easier, helping blade glide through wood, prevents the blades from gumming up with sap and debris after each cut. Efficient: Features easy-open safety lock, wire cutting notch, cushion-shock absorber system with spring makes garden pruning much more convenient and easier. Ergonomic Design: Handle made of high quality aluminum and wrapped with double-layer non-slip rubber cushioning, comfortable for small and large hand use.